A six-metre, 2.5-tonne great white shark has been attracting attention off the coast of Hawaii since Tuesday. The shark appeared off the coast of Oahu to feast on the carcass of a sperm whale - and local divers have taken advantage of the situation to snap a few pictures with the animal. Many believe the female shark to be the legendary "Deep Blue", a famous Great White that's estimated to be at least 50 years old. 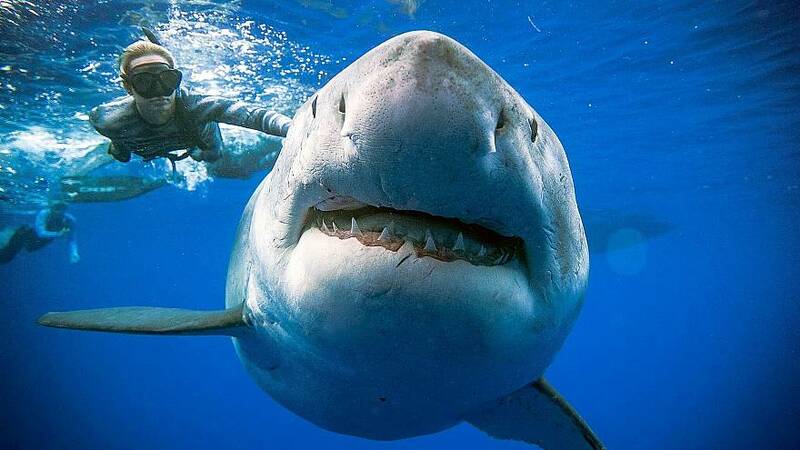 Diver and model Ocean Ramsey, who posted videos of her diving with the magnificent creature on Instagram, told the Honolulu Star Adviser about her experience swimming with the shark. "We saw a few (tiger sharks) and then she came up and all the other sharks split, and she started brushing up against the boat", she said, adding that "She was just this big beautiful gentle giant wanting to use our boat as a scratching post". "We went out at sunrise, and she stayed with us pretty much throughout the day", Ramsey recalled. The water is usually too warm in Hawaii for these kinds of sharks to swim in, which makes the sighting all the most extraordinary. Ocean, though, discourages people from following her lead and swimming with sharks. "Even smaller sharks are capable predators who need and deserve respect. However, they are not the mindless monsters they are portrayed in the media, as you can see. In my experience, this is the most mellow white shark I have ever had the privilege and honor of meeting", she wrote on an Instagram video of her and the Great White. Interviewed by NBC's Today Show, Ocean talked about how much swimming with the shark meant to her. "It fills my heart with joy and takes my breath away,” she said. "Truthfully, they swim past surfers, swimmers, and divers all day every day, and it’s so rare they ever make a mistake. It’s less than 10 human fatalities globally annually. And yet, people kill 70 to 100 million sharks every year", she commented. "It’s just so sad that so many people around the world would think ‘monster’ and want to kill her".